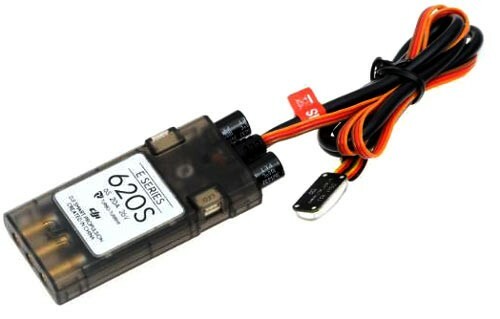 The DJI E800 620S 20A Opto ESC is a replacement ESC for the E800 Tuned Propulsion system. The E800 620S ESC's are part of the Tuned Propulsion system designed for multi-rotor use, the higher thrust to weight ratio from the E800 system increases the reliability, stability and agility of flight through enhanced aerodynamics and efficiency from the motor and propeller combination. The DJI 620S ESC's are the most advanced ESC in multirotor industry today because they use a much more efficient sine wave driver which has replaced the traditional square wave driver found in other ESC’s. The addition of a high performance MCU and extra bus communication allows the 620S ESC’s to control the motor in a “closed loop”, while monitoring the health and condition of the system in real time with DJI's "Smart ESC interface". The 620S ESC’s have an anti-spark circuit that is used to protect the circuit and the connectors during removal and connection of power to the ESC. The 620S's also have an active braking and energy recovery system that allow for additional manoeuvrability; this also helps to save precious battery power at the same time. The 620S ESC's have a built in LED to help with navigation at longer distances and to communicate the ESC status. DJI have added a data port to the ESC which will allow for future firmware updates online. The 620S ESC is designed to work with the Tuned Propulsion system and the recomended propeller to use is the 13 x 4.5 with the E800 3510 motors.